It was just another electoral campaign but there it dropped in the middle of the political arena, the issue of legalisation of recreational marijuana. A controversial social issue ready to inflame passionate opinions of both those who yearn the reform and those who oppose it. A controversial social issue that politicians would normally steer away from, as it exposes them to a cross-party barrage of criticism, later all drop in the middle of an electoral campaign. 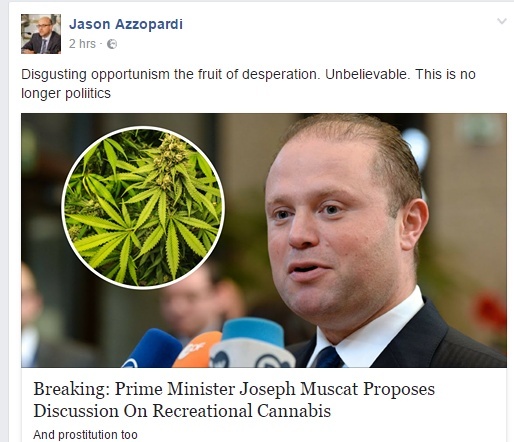 The Prime Minister of Malta Dr. Joseph Muscat went ahead and declared it was time for a National discussion about the introduction of recreational marijuana. The first criticisms didn’t take long to manifest themselves. The conservative MP Jason Azzoppardi was the first calling the move as “disgusting opportunism”, “the fruit of desperation”, and decreed that “this was no longer politics”. Similar criticism by other diehard nationalists followed on social media and online portals’ comments sections. This was not the first time Joseph Muscat staked his political career on a controversial social issue, in 2011 during the divorce referendum debate he had already came out to back and unequivocally declare his support for the introduction of this basic civil right. Back then this was not an easy decision as polls were showing that divorce didn’t really enjoy the support of the majority of the electorate. His stance was even more noteworthy because the polls were showing that Muscat could easily cruise towards a comfortable win in the forthcoming 2013 elections, as long as he could avoid any major misstep. All he had to do was lie low and avoid any controversial topic, but instead he chose to stand up and vouch for the rights of a grieved minority. Many of his own supporters questioned his decision to advocate the introduction of this civil right so strongly, and some even insinuated (more out of fear and frustration than a conspiracy theory) that he was trying to lose (the next election) on purpose. Mind you these were not people who opposed the introduction of divorce itself, they were just worried that his stance might jeopardise the Labour Party’s chances at the polls in the forthcoming election. The referendum’s outcome was a step in the right direction but he didn’t sit on his laurels and tone it down. Instead, he upped the ante and made an even more controversial civil right as one of his main electoral promises. In the country which had barely just supported the introduction of Divorce, Joseph Muscat pledged to introduce civil unions if elected as Prime Minister. During the past 4 years the Labour administration led by Joseph Muscat introduced a myriad of civil rights including the most advanced gender identity bill in the world, full-rights civil unions, and abolished discrimination practices in the adoption process. These reforms placed Malta at the top of the ILGA equality rankings in all of Europe, for 2 years in a row. In opposition the Labour Party had also opposed the introduction of SOPA and PIPA, which the Nationalist government and its exponents, including Simon Busuttil, were vehemently backing. Amongst other things this legislation would have obliged Internet service providers to keep tabs on their clients’ every move on the web and sparkled huge protests worldwide. Once in government, Labour removed an old law which forbid Carnival participants from making fun of politicians, abolished censorship and struck off an archaic law about the vilification of religion. Another reform consisted in limiting the power of the Executive branch of power with regards to Judicial appointments, by adding a requirement for prospective candidates to qualify for posts for Judges and Magistrates. Such choice will now be limited to a pool of lawyers previously approved by the independent Judicial Appointments Committee (JAC), whereas previously this was left at the complete discretion of the Government of the day. Some reforms with regards to how drug abuse is dealt with were also enacted, albeit these ended up being much more timid than what the Labour Government had initially proposed. Yes we’re finally here….and I am not going to beat around the bush! I am completely in favour of legalising cannabis even for recreational use. I am for regulating and allowing its cultivation. I am for licensing commercial outlets for the sale, and preferably on-site consumption of marijuana, to adults. Also my position is not influenced by any sort of personal interest as I neither smoke weed nor plan to do it anyways. A panel of 5 economists covering all the political spectrum sat around the same table to see if they could find some common ground. and they managed to agree on 6 economic policies. One of them was the legalisation of marijuana. From an economic point of view it is just stupid to keep it illegal. In addition regularising cannabis can generate revenue for the public coffers through Income tax paid on earnings, VAT charged on sales, fees for licencing establishments, and perhaps excise levied on the products. Of course economics shouldn’t be the only point of consideration in the matter, there are also health and social concerns. In research studies marijuana has been linked to an increase in the incidence of schizophrenia especially among people who have a genetically inherited tendency. Other studies show that it might possibly help Alzheimer patients when used in moderation. All in all the effects of consumption of cannabis are not that clear, but personally I would not classify it as a “healthy” habit. So, if I don not think it’s that healthy, why would I still support its legalisation? Here’s the point…. Marijuana is by far not the only thing that is (or can) be harmful to our health. All health-related research on marijuana show that it is much less harmful than junk food, soft drinks, cigarettes, or abuse of alcohol. Unless we demand that the police should raid Mc Donald’s restaurants, it doesn’t make sense to legally restrain people’s freedom on their cannabis consumption choices. Medical problems should be treated through a medical approach, social problems should be treated through a social approach. Unfortunately the prison system all around the world does not seem to be very good at actually reforming people. Rather than make people see the error of their ways and make amends, it has the tendency to increase the likelihood of their “graduates” relapsing into criminal behaviour. The legacy legislation had a penchant for sapping the opportunities of even minor offenders, and drive them to commit much more serious offences as a side effect. I am sure that there are a lot more issues that deserve to be raised and they should, but they should be raised by competent experts basing their opinions on rigorously researched scientifically established facts. That is exactly what we need, that is exactly what the (now re-elected) Prime Minister Dr. Joseph Muscat has called for, that is exactly what we should get! No don’t worry we’re not going on a rant on the “degradation of moral values” and the “degeneration of our society” which the conservative establishment would like to frame the advancements on civil rights issues as. A promise was made, but that does not necessarily mean it will be kept. I know many people are sceptic and their attitude is completely justified. It would not be the first time an electoral promise is not maintained. Back in 1998 the Nationalist Party had pledged to introduce a cohabitation bill if elected to government. PN won those elections, the following ones in 2003, and again (by the slimmest of margins) in 2008; yet the cohabitation bill was left “on the shelf accumulating dust” up until this year when a Labour majority led parliament finally approved it (unanimously I believe). Yeah in the meantime Malta had introduced divorce and civil unions causing the bill to require a significant overhaul. This is not the first time the legalisation of cannabis issue is brought up either, even by prominent politicians. Former Labour Prime Minister Karmenu Mifsud Bonnici had advocated for the legalisation of marijuana over 25 years ago, but he was never re-elected to carry through with this reform. However, this time IT DOES feel different. Joseph Muscat’s statement about recreational marijuana was followed by statements indicating consensus from the leaders of the two other main parties contesting the elections. It feels as if even the conservative establishment has realised that the civil rights tide is not something that can be stopped, not through direct confrontation at least.